← ASK FATHER: Valid absolution from Orthodox priest, but not from SSPX priest? In light of par. 22 of the Ceremoniale which states that presbyters are not to wear diaconal vestments but also in light of the return of cardinal deacons and the Vatican’s explanation of it, what can be done? Can a priest friend help me with a Solemn Mass by vesting and functioning as deacon if a competent one cannot be found? Thanks. with miters), and given the resurrection of the TLM, … to hell with CE 22. Let dalmatics abound. And lots and lots of maniples! On the one hand, one could claim that the Holy Father, by washing the feet of women on Holy Thursday, has not altered the liturgical law that restricts that washing to men. On the other hand, one could say that the Holy Father, by allowing Cardinals to vest as deacons, has abrogated CE 22. I’m certainly sympathetic, but be ready for accusations of hypocrisy. That said, “¡Vaya lío!” It’s what Pope Francis would want. … what were we talking about again? Oh, yes! Novus Ordo Masses with priests acting as deacons, and vesting in dalmatics. This entry was posted in ¡Hagan lío!, "How To..." - Practical Notes, ASK FATHER Question Box, Liturgy Science Theatre 3000 and tagged CE 22, contra legem, custom, dalmatics, deacons, Novus Ordo. Bookmark the permalink. I am sure the traditional orders (FSSP etc) have priests who act as deacons when they celebrate a High Mass. [We are talking about the Novus Ordo here.] They don’t have any permanent deacons I believe, so would be even less likely to have deacons available. I am not sure if the practice of cardinal deacons is sufficient to argue for the liceity of a priest serving as a deacon. Cardinal Deacons are proper part of papal ceremonies, not an exception to the law. Sacrosanctum Concilium 28 seems to indicate that one should always do all and only one’s proper ministry, and GIRM 335 seems to indicate vesture should reflect that. Now, this would not preclude another priest from doing functions that ordinarily the celebrant himself would do for lack of a proper deacon (as per GIRM 109), with perhaps the exception of elevating the chalice at the Doxology (since if he were concelebrating, that would not be his job, and if he were in choir he would not be at the altar). I, too, would like dalmatics and tunicles and maniples and birettas to gloriously rain from the sky and for every solemn Mass to have a full array of clergy (and duly installed ministers, the former “minor orders”) to fill every role, but I don’t think it is within the law of the NO liturgy to do so. 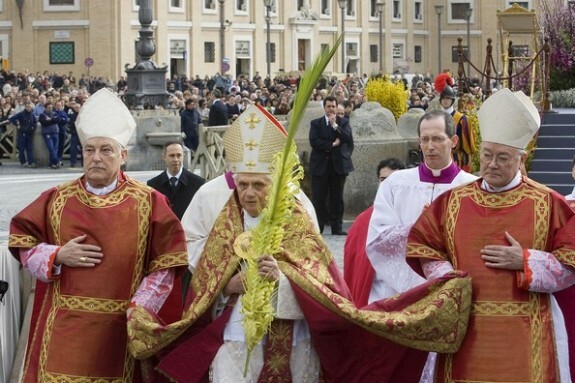 Looking at these pictures reminds me how much I miss Pope Benedict and his embracing of tradition. Picking up on Father AJ’s comment, I do not believe (although might be wrong) that we have not seen a Cardinal deacon at a papal liturgy since the accession of Pope Francis. Also, the cope worn by Benedict XVI in this photo and the use of the morse, which only the pope can wear, will likely not be seen again during this pontificate. Suarez, Wiestner, Sanchez, Vasquez, Schmalzgrueber, Ballerini-Palmieri, Salas, de Lugo, Reiffenstuel, Boeckhn, Kreutzwald, de Angelis, Biederlack, Baduin, Feye, Wernz, van den Berge, and Michiels are all reputable canonists of treasured memory who maintained that a custom contrary to the law could be (or, in some cases, MUST be) introduced in bad faith – that is, with the full knowledge that one is breaking the law. Would anyone doubt the propriety of one priest acting as altar server for another priest celebrating Mass? Better than the two of them concelebrating with no server present? Of course, there is no concelebration in the EF, so one priest serving another’s Mass is more common, but one occasionally sees it in the OF also. While one rarely sees a solemn EF Mass without a priest serving as either deacon or subdeacon, or both. Giuseppe: Wait – isn’t every priest a deacon? Father Know It All here in Chicago likes to make a similar point. He was ordained a deacon and he is still a deacon. While all priests in the Latin Rite are ordained deacons as a matter of discipline, they do not have to be. He is sent be his bishop to his parish to act as a priest in lieu of the bishop, but he might equally be sent as a deacon. I’m sure the intent is to allow for permanent deacons to have their role to play, but everyone ordained as a deacon stays a deacon permanently – it is an oncologic change. [Points for style. It’s “ontological”.] So, I can only imagine that the restriction applies to priests who were never ordained deacons, but to no one else. I am sure the traditional orders (FSSP etc) have priests who act as deacons when they celebrate a High Mass. They don’t have any permanent deacons I believe, so would be even less likely to have deacons available. If memory serves, at Clear Creek when there are no deacons, high mass is celebrated without one. Father Know It All here in Chicago likes to make a similar point. He was ordained a deacon and he is still a deacon. While all priests in the Latin Rite are ordained deacons as a matter of discipline, they do not have to be. As far as I know, the jury is still out on that last sentence. I have the thought the reformers wanted to encourage the “permanent” diaconate so they didn’t want priests to dress as deacons since it might discourage men becoming deacons, i.e., make it appear there is no need for them. A concelebrating priest can certainly act as a deacon at Mass, he’s just not to dress as one. Years ago Cardinal Wright said to me: The salvific benefits of the mass must be multiplied. Although the tradition of priests vesting as deacons in the Western Church is quite old, I have to admit that the current abrogation of the practice makes sense to me. It seems to me that vesting as a deacon when one is more than a deacon is equivalent to a deacon or priest dressing like the rest of the faithful and refusing to assist in choro on the grounds that he remains a member of Christ’s faithful when he becomes a cleric. I’m not sure whether Cardinal Deacons are a proper couter-example: they are vested in miter (which deacons cannot wear) and dalmatic (which bishops can wear). But maybe there is a solution. Couldn’t a priest vest like an assistant priest (i.e. cope) and assume the absent deacon’s parts? This would not violate the clear prescription of the ceremoniale against priests wearing diaconal vestments, and it would be clear that the priest so vested (1) is a priest and (2) is not concelebrating. Yes, this “solution” is imperfect since the assistant priest has a distinct liturgical role apart from the deacon in the EF, but maybe this is another area where mutual enrichment can help the lacunae of the OF. How would a priest wear his stole underneath the dalmatic? Crossed or diagonal? Cæremoniale Episcoporum 22 says that priests may not vest as deacons when a bishop is celebrating, it doesn’t say anything about when a priest is celebrating, although I suppose it could be implied. It seems the English Oratorians celebrate an OF ‘High Mass’ on Sundays, with a priest acting and vested as Deacon, and even ‘Sub Deacon’ (singing the Epistle, wearing a tunicle). At least the ones in Manchester and York do. It does bring to mind the “Gothic” dalmatics that my OF parish deacons wear that look too much like like chasubles (though less ornamental). Just as I was complimenting him on wearing the dalmatic and shaking his hand on it, someone else walked by and greeted him as “father.” (Though I think our Eastern brethren get that better with “Father Deacon N” than our style of “Deacon N”). Roman style vestments are much less prone to such confusion as well as being far more beautiful in general. There is, Uxixu, a certain level of confusion still as to what us non-oncologic (but definitely ontological) deacons, or perhaps a certain force of habit in calling a man in vestments “father”. As an example of that, I can cite a recent experience of mine. After Mass, a parishioner approached me and asked, “Deacon Hans, can I ask you a question?” After we spoke, as he was already walking away, he must have realized he’d forgotten his manners (we have as a rule very polite parishioners), he stopped briefly and turned to say, “Thank you, father.” He was on his way again before I realized what he’d said, and I wonder if he ever realized. So I conclude from that that even though I know he’s the Deacon, in my mind the automatic assumption is that vestments = priest. Well there we go then, a silly rule – I don’t call the deacon “mister”. I don’t know how to address him. Back to the good old days please, I find them less confusing. Say the Black and Do the Red. Unless you don’t agree with it. Then whatever. I don’t call the deacon “mister”. I don’t know how to address him. “Deacon” would be fine, truly. Here in Chicago it is the norm, anyway. Expanding on Chatto’s comment, having priests act as deacons in the OF is standard Oratory practice even when a bishop is celebrating. When last year Archbishop Longley celebrated Solemn Latin Mass at the Oxford Oratory there was a deacon and subdeacon, Assistant Priest , deacons at the throne (dalmatics over choir dress) and a bugia bearer. He doesn’t get this in his own cathedral. A priest I have been in dialogue about this told me that the principle behind CE22 is the “principle of truthfulness”–something which Bugnini and the consilium held as some kind of sacred cow. The principle holds that one should vest and function according to one’s proper and actual state (priests as priests, deacons as deacon, lectors as lectors…). If one were to follow this principle to its logical conclusion–it seems–a priest could never serve the Mass of another priest or even function as an MC at Mass since his proper role is that of priest and therefore Celebrant or Concelebrant. I think this is one of the most absurd things I have ever heard. It all seems to fall under the bigger umbrella of the post-conciliar operative principle of “we don’t know what we’re going to do, but we know what we’re not going to do–whatever it was that we did before”.